The UTEM SkyTracker is an articulated/overcenter aerial device with working heights up to 41' 3" (12.57m). 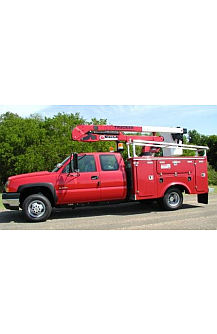 Overcenter aerial devices are common among electrical contractors, cooperatives and anyone with a need for greater side reaching capabilities. SkyTracker models are also available as non-insulated units. Please contact the factory for more information.